MarktHalle Neun, Market Hall Nine, is the ninth of the 14 market halls built in Berlin, of which 8 were destroyed during WW2. 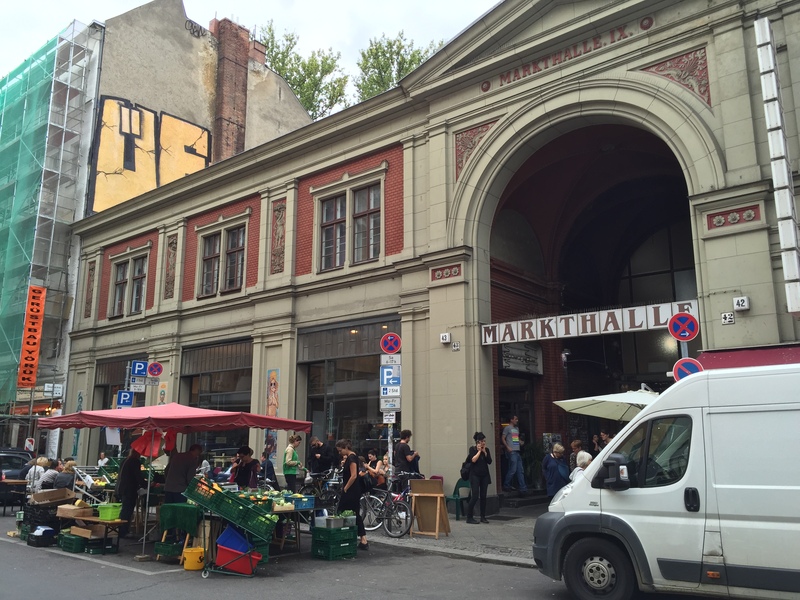 Originally the market, located in the Kreuzberg neighbourhood of West Berlin, worked very well until in the 1970s the first discount supermarkets emerged. This was when ALDI, one of the biggest discount chains of the world, moved in, and they are still present in the market, behind the kitchen. Then in 1975 a drugstore settled here and at the end of the 1990s, a textile discount moved in. These events started the process of small vendors moving out, and in 2003, even the last independent shopkeeper decided that he couldn’t run his business profitably anymore. This is when the sad story of this market really started: it was dead, with only three discount shops and a café, that is still there at the centre of the market today. One of the causes of this process is that Germans spend very little money on food in comparison to France or Southern Europe: Germans really prefer saving money to spending money, especially on food. On average, Germans spend 11% of their income on food, a very low proportion compared to other European countries. In the late 2000s, the City Council decided not to run this market anymore: feeding the city was no longer seen as a role of the public administration, and they decided to sell the building. As the City of Berlin needed money, the plan was to sell the building through a public competition, to the highest bidder. This plan was not supported by the local community, because the building was a special place for them. Kreuzberg is a very politicised part of Berlin, many people who live here like to get involved in local issues. A neighbourhood initiative was born to protest against the sale of the market, we wrote letters to the City of Berlin, and in 2010, there was a friendly occupation of the building, during which five hundred neighbours came here to drink coffee together. Did the occupation have a serious impact? The impact of this signal towards the city was strong and helped pushing towards a new model for selling public properties: ongoing negotiations with supermarket chains who wanted to purchase the building were stopped and a new model to sell the building evolved. The building would no longer be sold for the highest price but, with a fixed price, to the best concept in terms of social and cultural impact. The fixed price was calculated according to the commercial interest and opportunities of the building and the program was defined by the desires of the local community. This was assessed by a team of 5 experts from different parts of the public administration: the experts came from urban development, from the Ministry for Economy, from the local administration and from a trade organisation. They sat together, interviewed the neighbours, and came up with a kind of perfect setting for this place, and then everybody was invited to give their offer. Together with my two partners, we participated in the process, and were among the three selected from 17 applicants to spend half a year to deepen the concept and to find finance for the plan. Was it easy to find finance? Once we won the competition, it took us another year to find a bank that would give us the necessary money. It was very difficult, because even to so-called good banks which say they support what we are doing, saw this as a real estate deal. They saw us as a structure similar to big shopping malls, and the most important thing for them was the contract with Aldi. We told them that the contract was for another two years and we hoped to kick them out later; this is not what the banks expected. Buying the market hall costed 1.150.000 euros, this was the fixed price. We had an external specialist who told is how much different options to run the market would cost, and this was the basis of the long-term bank loan we took. As the building was constructed in 1891, we have a lot of maintenance costs, a lot of heating costs, and this is much more than what we pay monthly back to the bank. With all the rents we receive from all our tenants, we arrive to break even. We get a lot of feedbacks from vendors, even more than we want: as we are here constantly, we constantly hear about how they are doing. But our rents don’t depend on the sales and vendors don’t give us figures. Right now, we live from the café: it’s absurd, given the size of the while operation, but this is the two small cafeterias that create the profit, they are well frequented as there are many people coming to the market. What was your overall concept for the market hall? We opened in October 2011, and our concept was to revive the building as a real market, as a food market, and to do it step by step. We agreed that it won’t function of we just try to bring in small vendors and open from Monday to Saturday: we decided to to it step by step, starting with a weekly market on Friday and Saturday and move further from there. 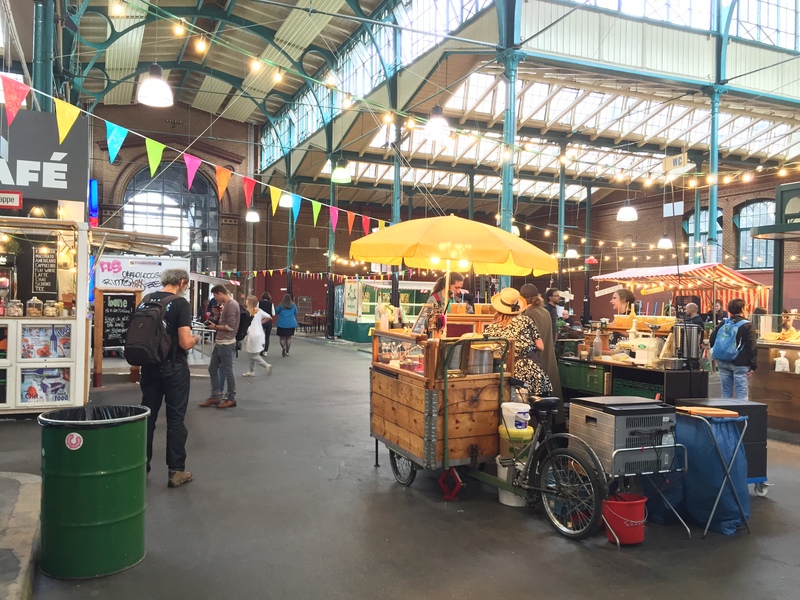 After starting with the Friday and Saturday markets, we opened a canteen – found someone who wanted to open a canteen – and then started to organise various flea markets together with Slow Food, a world-wide organisation fighting for good food. 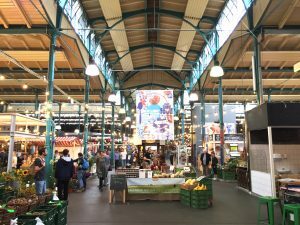 We now have a cheese market, a sweets market, a beer market, a special meat market: this way we managed to create a certain interest throughout Berlin, people began to discover that something is happening here, something to do with good food. The idea is to bring everything together here that the area offers in terms of good food. It means producers bit also the discussion: we don’t simply want to be a market, but also a marketplace where people meet, discuss and have the possibility to experience good food. Good food for us means regional food, possibly handcrafted food: that is not from the industry but from small producers versus global multinational companies. In the end, we also kept Aldi: there was a big discussion about this, as it’s a very mixed neighbourhood, also a very poor neighbourhood, and obviously the food we sell has a certain price. It’s not that anybody is getting rich from selling that food but still it costs more than in a supermarket. This was a dilemma for us, because we wanted to bring two things together: how can you feed yourself in a healthy way even if you don’t earn a lot? 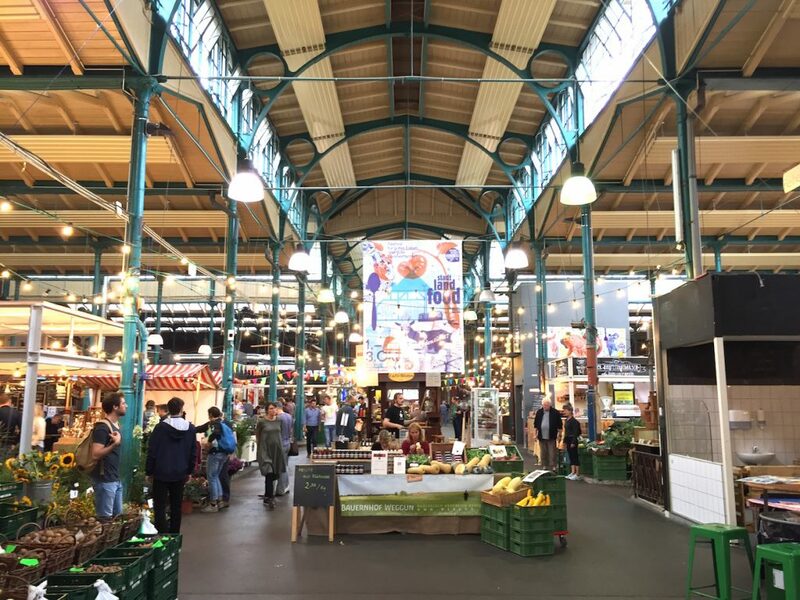 This is why we decided to keep the supermarket in the market hall, so that people for whom the quality of the food is not so crucial or they cannot afford it, they can use the supermarket and might try out something at the market on their way home and get the taste of it. Berlin, Economy , agriculture, commerce, English, finance, food, Funding the Cooperative City, heritage, market, renovation.